One of my first fountain pens is the Platinum Preppy. This is touted to be a good pen for fountain pen beginners, because it is rather cheap yet it works quite well. There are three nib sizes available, which are designated by numbers found on the barrel: 05 which is maybe a broad or medium, 03 which is medium to fine, and 02 which is the extra fine. It comes in an array of colors, and it comes with a cartridge with ink in a matching color as the pen. These are the three I bought at Scribe Writing Essentials. The 03 and 05 are both Php195, and the 02 costs Php275. Extra cartridges are also available. The Preppy is made mostly of lightweight plastic. The cap is a snap-on, with a springy feature at the end to keep the nib protected. The clip is serviceable enough. I have heard some reports that the plastic can be quite easily cracked, although mine seems to have avoided that fate. The Preppy is also usually the first to be suggested when one wants to try out the eyedropper FPs, since the barrel is made entirely of plastic and does not have holes. The nibs of the 03 and 05 are colored to match the barrel, while the 02 nibs are just left bare. For some time I could not really appreciate the Preppy when I only had the 03 and 05 at first. It felt like it was too leaky and wet for my taste; I was firmly on the fine/extra fine camp. I was ecstatic when the 02 finally became available, and it really writes such a fine line that it can work even with inferior paper. The 02 in particular is my Hobonichi mainstay, because it really works well with the paper and the ink dries fast. At some point, I started to appreciate the fatter nibs especially when I got a few ink samplers from Everything Calligraphy. Wider nibs actually show the ink’s shading properties a lot more than the fine and extra fine ones, and that was when I started to use the 03 and 05 more. I’m very happy with how all three of them write, and the price point is really hard to beat. One of my favorite pens recently is the Pilot Coleto multipen. It is called a multipen because it has the ability to carry more than one color of ink, or even carrying a pencil inside the same pen. There are several options for the Coleto barrel: how many “slots” it has, and the overall look of the barrel itself. Over the last few months I have accumulated a total of six Coleto barrels, although I only use at most two at a time. The two on the leftmost have three slots and the rest have four. The two leftmost barrels in the photos are my first two. They are plain, clear barrels with flat tops and a rubberized grip section. These are readily available in National Bookstore, which is how I first got into Pilot Coletos in the first place. At some point, though, I decided I wanted more colors in my Coletos, and I wanted something more fun than just plain barrels. I got my next two Coletos (middle two) separately, the one with the black flowers (from the Mary Quant collection) from DolcesOnline and the breakfast print one (from an older collection) from DavaoArts, and as you can see they are both printed with fun things. At some point I was taking my Coletos everywhere, including formal work situations, and I thought that I needed something more formal looking. This is when I decided to get the last two, from CraftyLane. The black one is just a plain N4 barrel, while the rightmost is a Coleto Lumio, which is probably the most premium Coleto barrel type available since it is made of metal rather than plastic. Taking a closer look at the tops of the Coletos, the caps are differently shaped depending on the model. This is where the inks are loaded, inserted into each of the slots where the springs are located. As you can see here, only the rightmost two barrels have inks in them. Looking now at the bottom of the barrels, you can see that there is a significant difference in the barrel thickness between the 3-slot ones and the 4-slot ones (not including the Lumio). This is of course because of the added slot. Interestingly enough, only the plain clear barrels have that rubberized grip. The Lumio is special in that its grip section is quite thinner than the other 4-slot barrels, which is one of the reasons why it’s premium. Here is a closer view of the tops of the barrels. The plain clear barrels go for around Php120 if I’m not mistaken. The Mary Quant barrel (black flowers print) was Php220, the breakfast barrel was Php180, the N4 black barrel was Php120, and the Lumio was Php580. I really like Pilot Coleto, even though there have been some negative feedback online about how fast the ink runs out. I am personally not bothered by it, and I really like how fine the 0.3 tip writes. There are two other tip sizes available: 0.4 and 0.5. The most common colors (black, red, blue, green, purple, orange) are readily available at National Bookstore for Php43.50, so it’s not going to be hard finding refills. I think this will remain my mainstay non-fountain pen for the near future. Just a quick disclaimer: This is not going to be a comprehensive review; there are a lot of already-written, more in-depth review of the Pilot Metropolitan out there. This is going to be a short review. Pilot Metropolitan (which I affectionately call the Metro) is usually one of the first few fountain pens mentioned when asked about good entry-level fountain pens. It’s relatively cheap, well-built, a great consistent writer, and now quite easily accessible locally. It has a full-metal body, which makes it on the heavy side. It can use either cartridges or converters, although both are proprietary to Pilot, which means you do have the option of using bottled inks (with the converter) or not if you can’t be bothered (cartridges). One of the things I like about the Metro is the nib. It comes in either fine (F) or medium (M), being Japanese both of which are usually on the narrower side compared to European/American nibs. This is how I prefer my pens; the narrower, the better! Another thing I like is how sleek and professional they look, even the more colorful ones. The brushed metal finish is very elegant, and the patterns in the middle give a good contrast and personality to the pens. Now, one thing I don’t like about the Metro is the lack of an ink window. It is very hard to tell how much ink you have left in the pen unless you go through the trouble of opening up the pen to check the converter or cartridge. Another thing I don’t like is the converter. The pens usually come with a black cartridge and a squeeze-type converter. I immediately replace that converter with the CON-50, the screw-type converter as seen in the purple and red Metros below. The drawback to these is the very small ink capacity. My solution to these is to just reuse the cartridges once I have consumed the ink, but refilling them can be an exercise in frustration until you get the hang of it. Pilot Metropolitans go for around Php600 or less, depending on where you buy. It is available online at Everything Calligraphy. Big stores such as National Bookstore also carry them, but the supply is rather spotty. There is supposedly another source called Cosmos Bazar which is located in a place I rarely go to, but as far as I know they are the official distributor of Pilot in the Philippines, so their prices are cheaper. My black Metro was from National Bookstores in one of the rare times I was able to catch stocks, and my two Retro Pops are ordered through a Massdrop deal. Now, the only reason I don’t have more of these is because I believe in using what I have. If I have too many pens, then I can’t possibly be maximizing the use of all of them. Otherwise, I would have bought all colors of the Retro Pop line, and a gold and silver version from the basic line as well! They are that good! To be honest this review comes in too late. 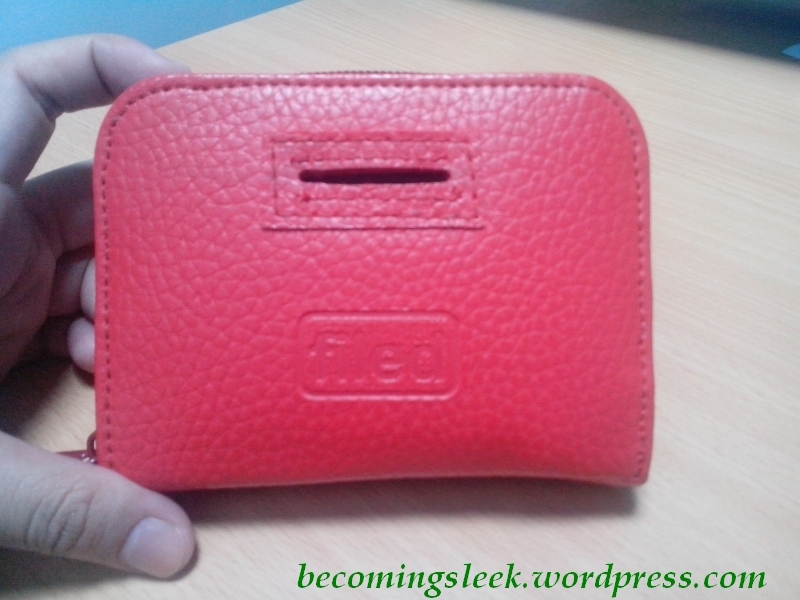 This is the Blank and Write 10-slot Card Holder that I am currently using to hold my cards in my planner wallet. I say it’s too late, because Justin’s supplier no longer makes these. I would still like to show you, in case you come across something like this in the wild. It comes packaged like this. It appears that this is of a Japanese make. Here is my card holder, now filled with 9 cards. I used some page flags to cover some personal information. A few more details regarding this card holder. This is about the height of a field notes-sized notebook, but narrower. To be exact, its dimensions when closed are 3.25×5.3″. I really like using this because it goes well with the idea of a planner wallet. I have shown this previously here. It does not have the thinnest of profiles, considering it’s holding 9 cards. It does work for my purposes though! While shooting these photos, I thought of trying it out as a stationery organizer. It fits most of my washi samplers, a few business cards, a small page flag set, and a cute little paperclip. I could not find small sticker sheets, but I think they would fit here as well. Heads up, there’s a new subscription box in town! This is Pink Paper Box, a planner and crafting oriented monthly subscription box, and it’s very new. This month’s box titled Spring Summer Fling is only the second, but I’m already quite hooked! How does Pink Paper Box work? Sign ups happen over at the Pink Paper Box website (Facebook) and submitted through a google form. The subscriptions cost Php500 (1 month), Php1450 (3 months) or Php2850 (6 months), and this fee already includes the shipping. Owner and main girl Marrien is very hands-on and personal, and will keep in touch with you regarding your subscription. One of the things I’m also passionate about, outside of makeup and nails, is containers. Any kind of container makes my heart flutter. I think I inherited this passion from my dad, who would also appreciate the container more than the contents like me. 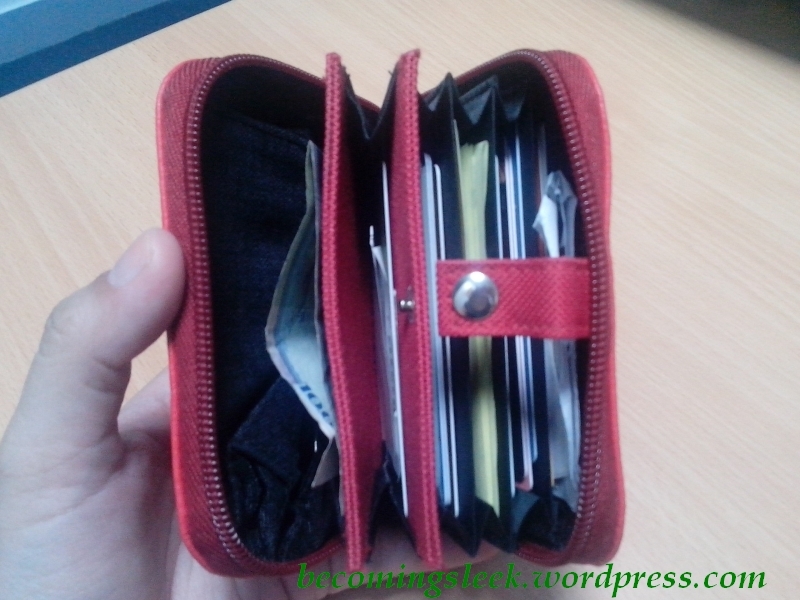 One of my recent acquisitions is this Filed Pocket Wallet. 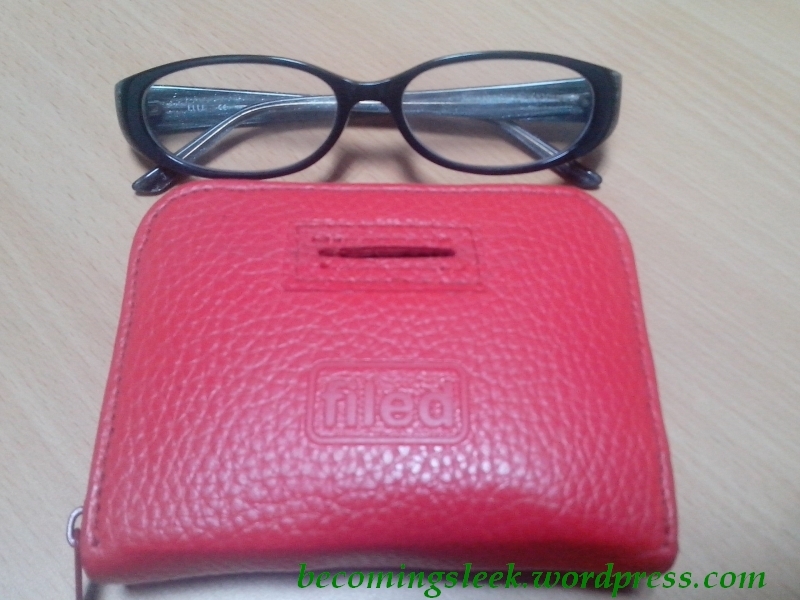 This is the wallet’s size compared to my eyeglasses. 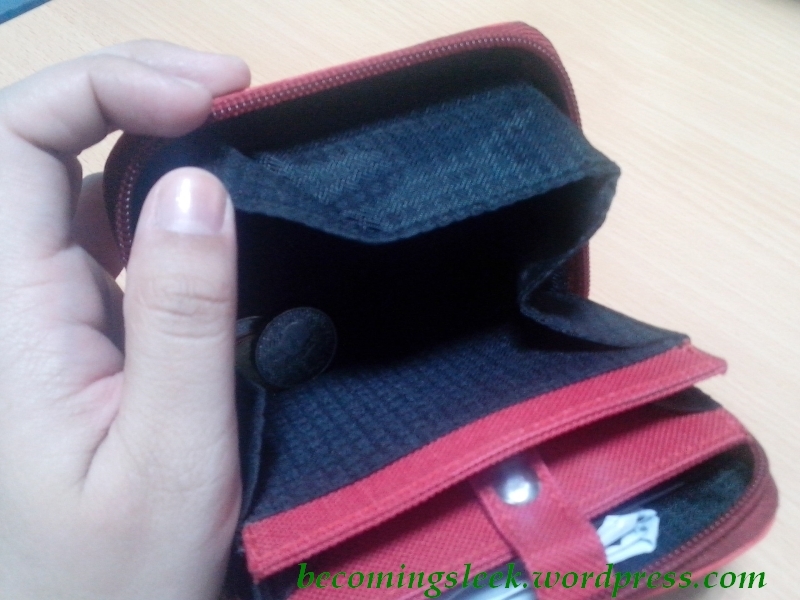 It is a wallet that contains an essential requirement I have for wallets and bags: compartments. And compartments it has aplenty! Check out the inside. It has compartments for cards, receipts, paper bills, and others. It even has a snap button for added security. Here it is with the snap button closed. 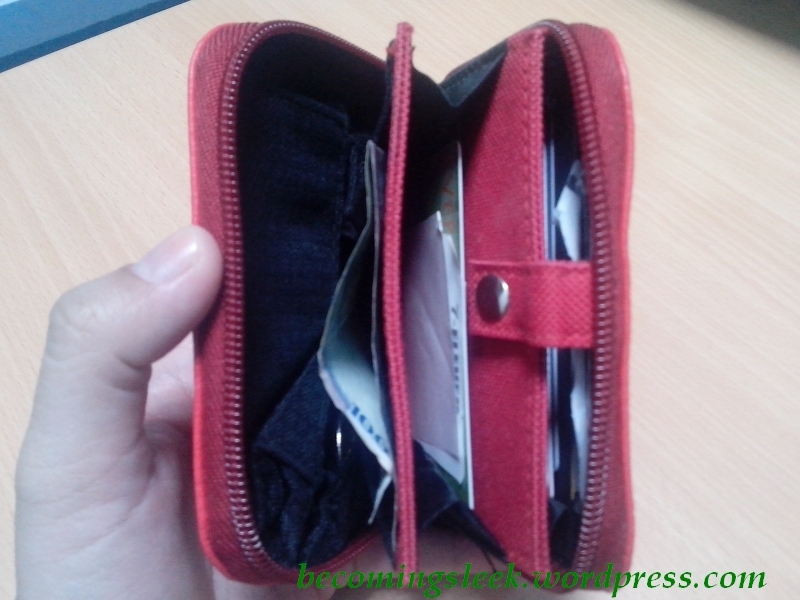 One of the unique features of the Pocket Wallet is the external slot for coins. You don’t have to open the wallet just to put in coins. This is especially useful for commuters. Inside, the coins go into this expandable bin. It’s actually pretty large, and can hold a lot of coins. There is also a small slot at the back for easy access. You can put here your parking tickets or something that needs to be accessed quickly. 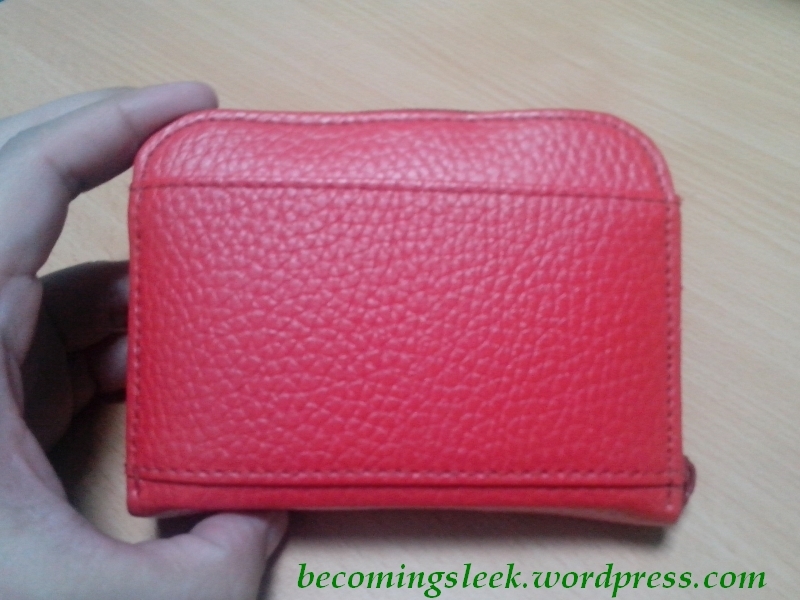 One of my favorite features of this wallet is the quality leatherette material. It looks and feels pretty sturdy and does not look cheap at all. There is the feeling that this is very well made, and that includes the stitching and zipper. According to their website, they use Lacoste Leatherette for their folders and Ripstop for bags and cases, and all products are made in the Philippines. Would you believe that this costs only Php295? It’s unbelievably affordable for the quality and function that it provides! This can be bought from Filed’s online store, and Fully Booked branches. It’s available in 8 colors. It’s a little hard to hunt for the specific color that you like though, at Fully Booked, as they don’t stock regularly. 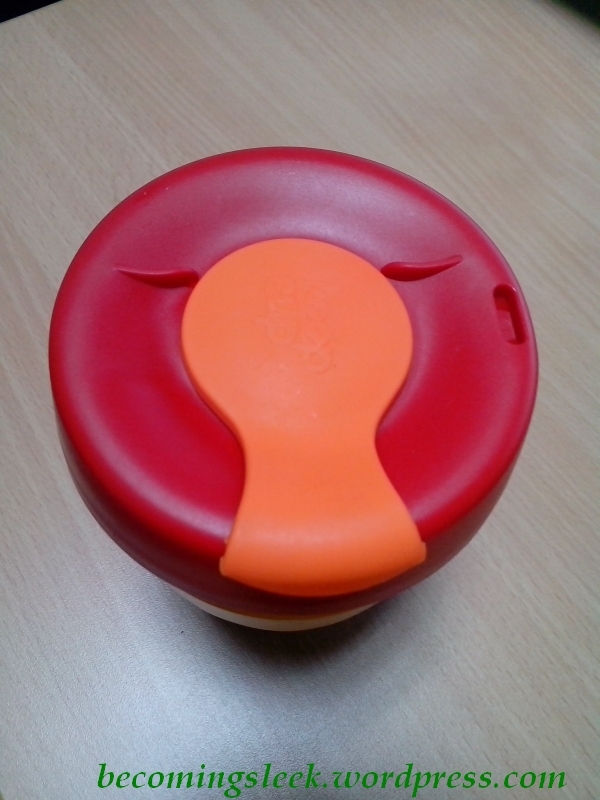 I think I got this red one at Fully Booked Eastwood. If you want a specific color, it’s better to buy from the online store. 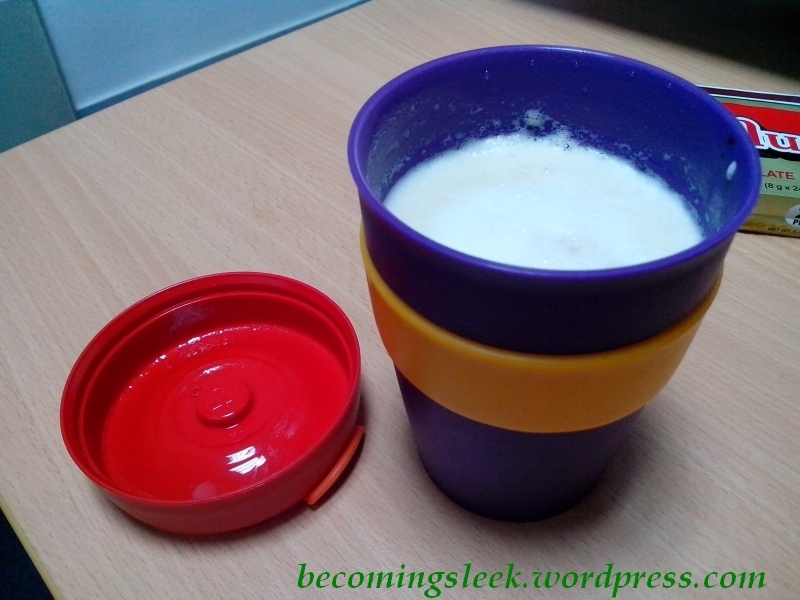 What is a KeepCup? It’s basically a reusable coffee cup, but what distinguishes it from the rest is that it is barista-standard. This means that you can give this to your regular coffeeshop barista, and he/she would be able to fit it under the standard espresso spouts. It also fits in standard cup holders. As a bonus, it comes in exciting colors! 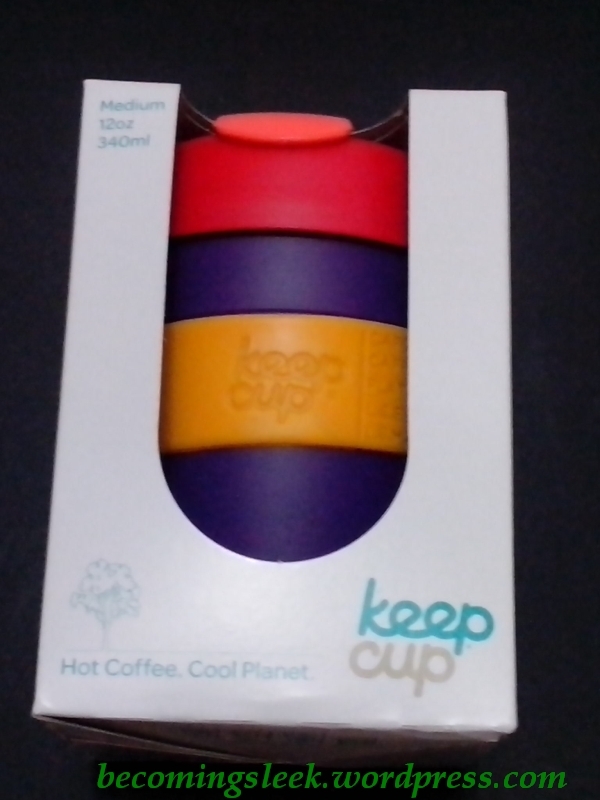 House of Flair is KeepCup’s official distributor here in the Philippines. 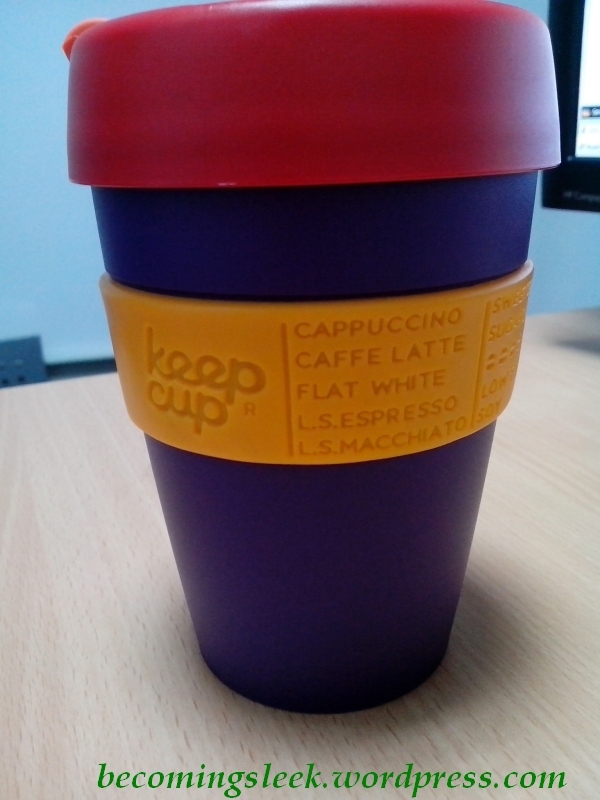 This is a medium size cup (12oz/340ml) and goes for $14 in KeepCup’s store. For HoF’s pricing, check here. [EDIT: HoF’s KeepCups repriced to Php850! Check out their on hand stock here.] It can fit a Tall-sized Starbucks drink. And to Starbucks I did go for my buena mano drink, just a regular latte. It looks really good with my Cup!